We deliver essential tools for attorneys across the state. We deliver a targeted, focused audience. We let you reach your best customers every week. We position you in front of influential opinion leaders and high-end consumers. 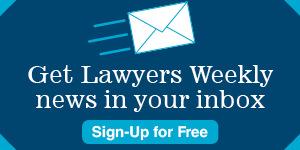 Who are Virginia Lawyers Weekly readers? They are the key decision makers. 65% are partners or principals in a private firm or solo office, according to readership studies. They are in their prime earning years: Average age is 53. They are experienced: 65% have been in practice 20 years or more. They are sought-after consumers with an average net worth of over $1 million and an average household income of $220,000. They rely on Virginia Lawyers Media for information about their profession. 73% of our readers spend half an hour or more with our paper every week. Each copy is seen by more than one person.